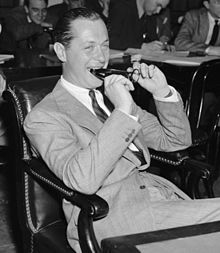 Fishkill Landing, New York (now Beacon, New York), U.S.
Robert Montgomery (May 21, 1904 – September 27, 1981) was an American actor and director. He was born in Beacon, New York. He starred in many movies, including Night Must Fall. He died in New York City from cancer. He was cremated. This page was last changed on 22 April 2019, at 17:36.